A goal in either half earned Chichester City a 2-0 win at Little Common and put them back on top of the table. Although they created next to nothing in the way of goalscoring opportunities, Common restricted Chichester to relatively few chances and passed the ball nicely at times. In the first half Common did a good containing job. For all Chichester’s possession, they created little - an early shot from the edge of the box went wide, a 30-yard free kick was just off target and a low drive from 25 yards was safely gathered by Common goalkeeper Matt Cruttwell. Just as Common looked like they’d make it to the break on level terms, Chichester struck in the second minute of added time. A header by Common defender Lewis Parsons was picked up by Gicu Iordache, who took a touch to control before unleashing a terrific strike into the far corner of the net from the left-hand side of the area. Scott Jones’ header from a right-wing corner went in after a deflection. 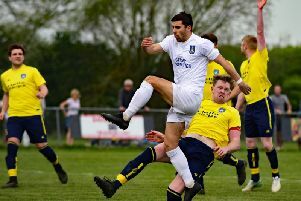 City host Eastbourne Town in the SCFL premier on Saturday. They go to Pagham in Peter Bentley Cup next Tuesday.